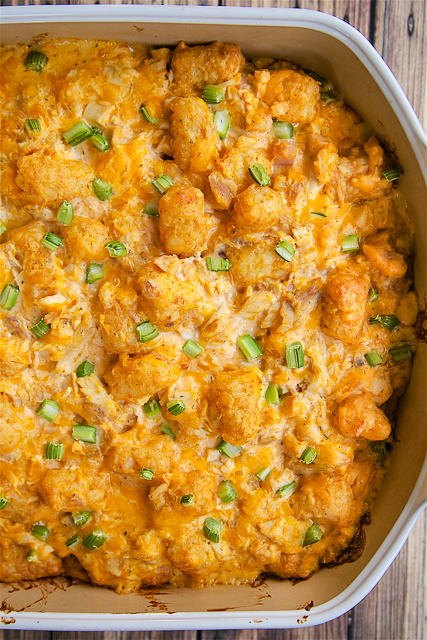 Buffalo Chicken Tater Tot Casserole - SO good! Great casserole for a potluck or watching football!! Everyone LOVES this recipe! Chicken, sour cream, cream of chicken soup, buffalo wing sauce, cheddar cheese, tater tots and celery. Can make ahead and freeze for later. It's a big weekend for football. We find out who will be playing in the Super Bowl! Woohoo! I think Buffalo Chicken is the quintessential football food. This Buffalo Chicken Tater Tot Casserole is one of our favorite buffalo chicken dishes. It is SO good!! We've made it several times this football season and it was a hit every single time!! 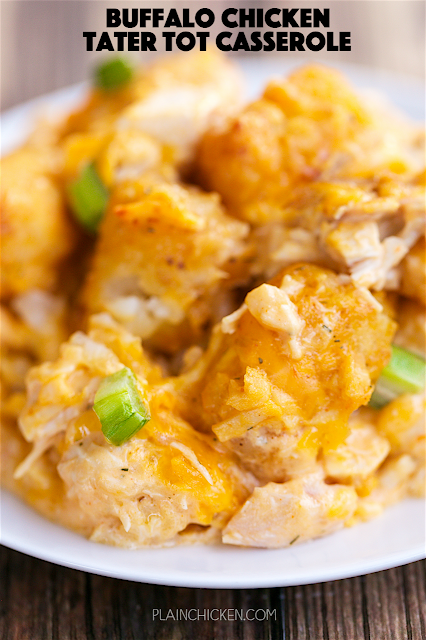 This Buffalo Chicken Tater Tot Casserole can be made ahead of time and frozen unbaked. Just thaw it in the refrigerator overnight before baking. You can also split the casserole between two foil pans. We like to bake one and freeze the other one for later. I used a 1/4 cup of buffalo sauce in this casserole. We did not think it was spicy. Make sure to adjust the buffalo sauce up or down to your tastes. I like to use Frank's Red Hot Buffalo Wings Sauce. In a large bowl, mix together chicken, sour cream, soup, buffalo sauce and cheese. Fold in frozen tater tots. Spoon mixture into prepared pan. Top with chopped celery. Wow this looks amazing and right up my alley! Thanks for sharing! I substituted chopped green onions instead of the celery. I also added crumbled blue cheese on top. It was delicious! How did subbing ranch for sour cream turn out? Thanks! How did you cook the chicken? Did you boil it or maybe pan sear it first? Either is fine. I usually just use rotisserie chicken. Do you use Sharp Cheddar or Mild Cheddar Cheese?? And I am making this for a potluck tonight at work, will it get soggy within 3 hours of cooking it? If so, how can I prevent that? Both Sharp or Mild cheddar will work fine - just whatever you like best. It doesn't get soggy after baking.